Come to Ellery Lake for a chance to see 120’ Ellery Lake Falls, stay for the creek side camping, abundant fishing, and access to Yosemite National Park. Ellery Lake is located about an hour north of Mammoth Lakes, and is a great gateway to Yosemite National Park. Camp along Lee Vining Creek at one of 12 campsites. Experience 120’ Ellery Lake Falls. 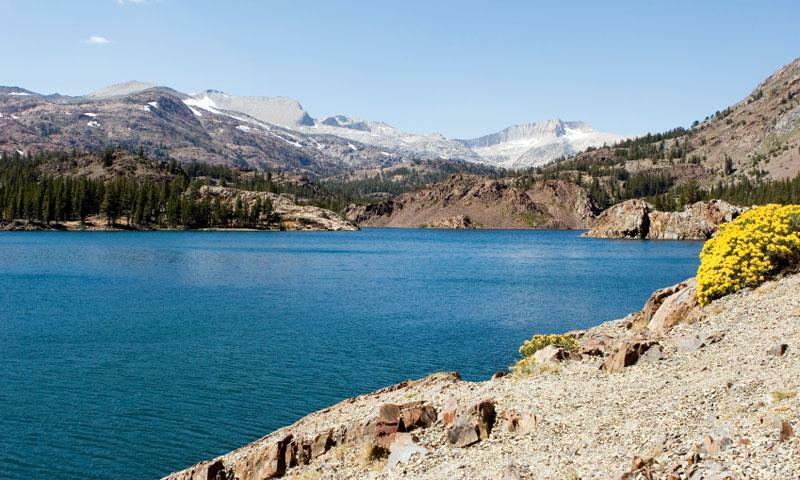 Set in Upper Lee Vining Canyon, just miles from Yosemite National parks east entrance, Ellery Lakes promises visitors breathtaking alpine scenery, abundant fishing, and a chance to glimpse Ellery Lake Falls. Ellery Lake is located on Highway 120 just outside of Yosemite. From Mammoth Lakes, take US 395 north for 25 miles, then turn left at CA 120/Tioga Pass Rd. Continue straight for 9 miles to find Ellery Lake. CA 120 is subject to winter closures. April through October is the best time to visit. Ellery Lake’s alpine scenery, sparkling waters, and proximity to Yosemite National Park make it an favorite camping destination. The campground is located about 100 yards from the lakeshore, along Lee Vining Creek. Of the twelve available sites, about half are located on the creek. The camp fee is $17.00, and sites are offered on a first-come first-served basis. Ellery is regularly stocked with 11”-12” rainbow trout. Brook and brown trout also make occasional appearances. The fishing here is great, both from shore, as well as from a boat. This impressive waterfall drops 128 feet from Ellery Lake, along Lee Vining Creek. For most, the view from the road is your best bet, as precipitous canyon walls guard the valley from hikers.